The famous recently-deceased physicist wasn't done changing physics. Stephen Hawking may have died on March 14, but he’s still pushing physics forward. Today, the peer-reviewed Journal of High Energy Physics (JHEP) published Hawking’s final theory on the universe’s origin, titled “A Smooth Exit from Eternal Inflation?” The famed physicist wrote the paper in collaboration with Thomas Hertog, a professor at Belgium’s Catholic University of Leuven (KU Leuven), and it presents a multiverse theory unlike any other. Here’s a (really) simplified explanation of (one) multiverse theory. The Big Bang happened. The universe expanded. In some places, it kept expanding. In others, it stopped. In the places where it stopped, universes formed — ours, and a potentially infinite number of others. 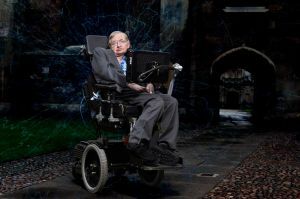 According to Hertog, Hawking was never a big fan of the multiverse theory, but he knew it was hard to avoid. Hertog first announced this theory at a July 2017 event to celebrate Hawking’s 75th birthday. Two weeks before Hawking’s death, he submitted his most up-to-date version of the theory, which led to today’s publication in JHEP. In their paper, Hawking and Hertog use a mix of string theory, holographic principle, and math problems that resemble hieroglyphics to arrive at a multiverse theory that’s less unwieldy than the current standard. “We are not down to a single, unique universe, but our findings imply a significant reduction of the multiverse, to a much smaller range of possible universes,” said Hawking, according to a Cambridge University press release. Hetzog plans to test the theory’s assumptions in the “real world” by using space telescopes to study gravitational waves. While Hawking won’t be able to continue this work alongside his partner, he seemed satisfied with what he accomplished during his lifetime. With today’s publication of Hawking’s final theory, that “small” contribution just got a little bigger.